24″ X 24″ Centered On Table, With #9, Expanded Metal. Single 13″ X 36″ Filter Cartridge, 240 Sq Ft Of Pleated, 80/20 Blend Of Filter Material With Bottom Dust Containment Drawer. The Exhaust Area Lined With Sound Abatement Material. 3. Switches: One (1) Switch, Controls Both Lights & Motor. 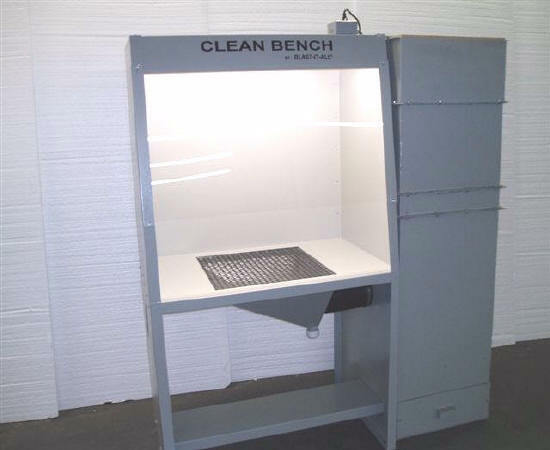 As An Option A 24″ X 48″ Plexiglass Can Be Provided For Additional Operator Protection. As An Option A Reverse Air Device Can Be Provided.